Few people in Thurgarton will know the name of Walter Hilton. 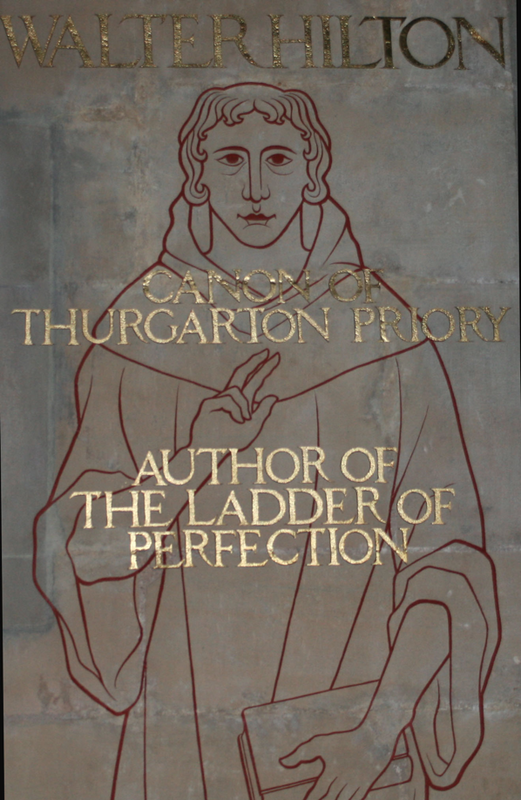 He was a canon of Thurgarton Priory in the late 14th century but more importantly he was one of the greatest religious teachers and writers of late mediaeval England. Walter Hilton was born sometime about 1340 probably in the East Midlands and would have been a youngster when the Black Death ravaged England in 1348/9. There is good evidence that he studied law at Cambridge University. In 1371 he was a clerk to the Diocese of Lincoln and was granted the canonry and prebend of Abergwili in Carmarthenshire; in 1375 he is recorded as attending the Consistory Court at Ely. At some stage in the 1370s he appears to have lived as a hermit but abandoned the solitary life and in the following decade he entered the Augustinian order and spent the remaining years of his life as a canon in Thurgarton Priory where he died on 24th March, 1396. So much for the known facts of his life, albeit rather sketchy, but what of his writing and teaching? The most important of Hilton’s works were The Ladder of Perfection and The Mixed Life both written in the English of the East Midlands. Hilton was well versed in Latin, the usual language for religious treatise at the time, but he was evidently concerned that his writing should be widely accessible. 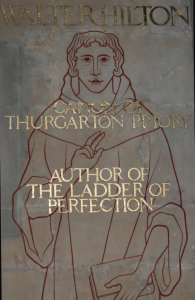 The clergy however were more accustomed to reading learned works in Latin ( and may have struggled with the Midlands vernacular ) and shortly after Hilton’s death the Ladder of Perfection was translated into Latin by Thomas Fishlake, a Carmelite priest. His books became mediaeval bestsellers. Hilton encouraged his readers to adopt a routine of prayer and contemplation in their lives and by so doing attain a greater knowledge of self and of God.. This may not seem a novel approach but amongst orthodox Catholics of the time, especially the laity, there was a growing desire for a more personal religious experience – a desire which Hilton addresses directly in the ‘Mixed Life’. This was written to a layman who was considering abandoning his secular life for a religious one, but Hilton encourages him to pursue both and advises him on how to live the mixed life both ‘active’ and ‘spiritual’. 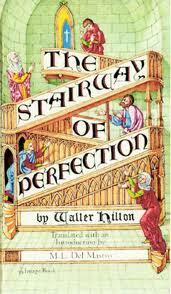 The Ladder of Perfection was written in two parts; the earlier chapters were addressed to an anchoress (a female hermit) and the second part, written much later, to a wider audience. The book is a step by step guide from the first stages of faith towards the more perfect Christian life. He writes with an obvious deep knowledge of Scripture and Theology but illustrates his ideas with examples from ordinary life. 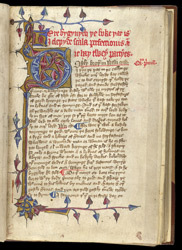 Hilton, along with Richard Rolle and Julian of Norwich, belongs to a tradition of late mediaeval religious writers labelled the English Mystics by modern scholars. However Hilton avoids the more mysterious visionary language of these other writers; his is a common sense, plain English approach to the spiritual life. He specifically warns against the deliberate seeking after ecstatic visions whether by excesses of emotion or by ascetic rituals of physical deprivation. Calm authority in tumultuous times. The 14th century was a period of great suffering and upheaval. The arrival of the Black Death in 1348 wiped out over a third of England’s population and more were to fall victim to further outbreaks of the disease in the following decades. At a time when the populace might look for aid from its rulers the Crown was dissipating the country’s resources on waging war with the French (the Hundred Years War) and the Church was preoccupied with the papal split between Rome and Avignon. The old feudal structures of society were challenged as labourers realised that their services could command higher rewards and such raised expectations led to periods of unrest culminating in the Peasants Revolt of 1381. In Oxford a group of scholars produced an English version of the Bible; one of their leaders was John Wycliffe who became increasingly vocal in teaching against many of the traditional practices and beliefs of the Roman Catholic church. 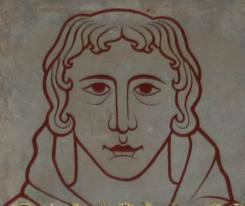 He and his many followers (Lollards) were eventually labelled as heretics by the church establishment. In 1388 Walter Hilton’s superior, William of Sapperton, Prior of Thurgarton was appointed by Thomas Arundel (then Archbishop of York) to seek out and suppress Lollard teaching and literature in Nottinghamshire. Hilton is almost silent about these momentous events; in his letters he warns against heresy and defends the use of images in churches, but otherwise his writing focuses completely on matters spiritual and how to achieve a more perfect life. At first sight his approach may seem blinkered but amidst all the turbulence and troubles of his times he comes across as a voice of calm authority with a clear message – concentrate of the important matters of life, on your soul and its journey. 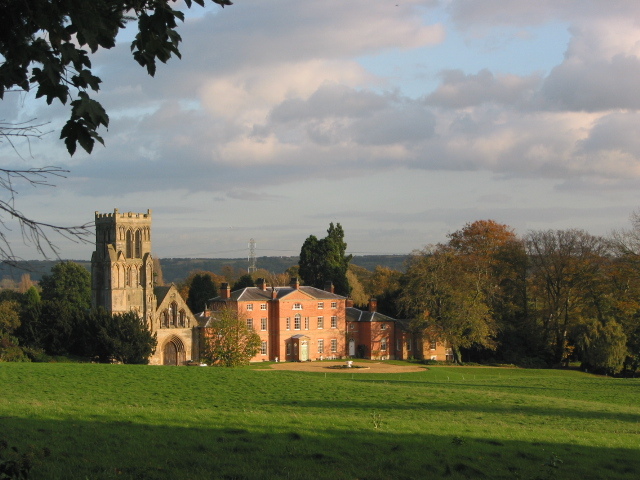 At about the same time as Hilton entered the Augustinian house his friend Adam Horsley had become a Carthusian monk at Beauvale Priory which lay just 10 miles from Thurgarton. Ten years previously Horsely, Controller of the Rolls, was considering abandoning his life as a high flying civil servant for the monastic life; he sought advice from Hilton who encouraged his friend to enter the Carthusian order – the most disciplined and eremitical (hermit like) of all the religious orders. The Carthusians were avid collectors and copiers of religious works and the library at Thurgarton Priory included a number of books which appear to have been produced at Beauvale. Hilton’s teachings were especially favoured by the Carthusians and many of the earlier manuscript versions of his books would have emanated from houses such as Beauvale. The popularity of Hilton’s books continued up to the 16th century and the Reformation. In 1494, almost a hundred years after his death, the Ladder of Perfection and The Mixed Life were printed in London by Wykyn de Worde – some of the earliest books in English to be published. Five reprints appeared over the following decades up to the 1530s. In 1535 Sir Thomas More was a prisoner in the Tower for resisting Henry VIII’s claim to supremacy of the church and recommended Hilton’s work to his gaoler. 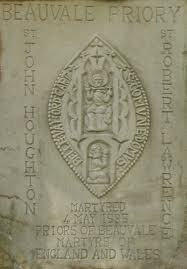 On May 4th 1535 he witnessed the departure of five priests from the Tower to their execution at Tyburn; among them were the Carthusian monks Robert Lawrence and John Houghton, Prior and ex Prior of Beauvale Priory. Their offence, as with Thomas More, was a refusal to acknowledge the king as head of the church; two months later Sir Thomas made the same journey to the executioner’s block at Tyburn. The religious libraries of England were a target of the 16th century reformers and included in the many bonfires of suspect volumes were Hilton’s books. His work remained part of the Roman Catholic tradition with a continuing devotion amongst the Carthusians. In the Church of England, Hilton’s teaching was initially suppressed and then forgotten until renewed interest in the 19th century. The Augustinian Priory at Thurgarton was on a national scale a modest house but it had a significant influence within the surrounding region of the East Midlands. At the start of the 14th century the Priory had suffered from financial mismanagement and lax discipline but by Hilton’s time probity had been restored. Why Hilton chose Thurgarton is not known – maybe it was the calm and peaceful atmosphere noted by modern visitors to St Peter’s church, the remnant of the old Priory church. We know a little of the library at Thurgarton Priory some of which has survived and suggests a place of learning and study. 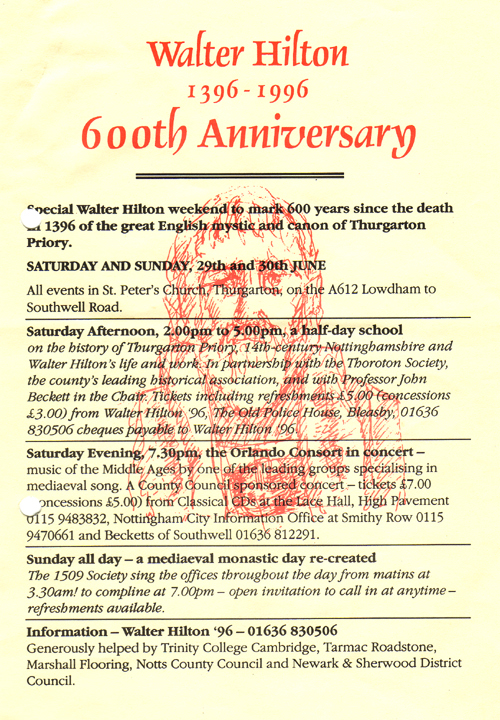 In 1996 the 600th anniversary of Walter Hilton’s death was marked by a weekend of lectures, services and a concert of mediaeval music at St Peter’s church. In 2011 Angela Ashwin led a day of prayer and contemplation based on Hilton’s teachings entitled ‘Walter Hilton – the Gentle Encourager’. Over seventy early versions of the Scale of Perfection and The Mixed Life survive whole or in parts and a few combined into one volume. There have been numerous translations some of which are listed below and most of which contain useful introductions. H. Gardner, Walter Hilton and the Mystical Tradition in England. S. Hastings, ‘ The Scale of Perfection and 14th century Mysticism’. 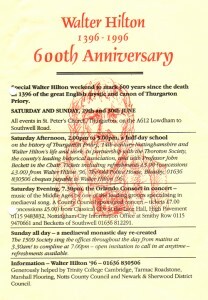 Lecture delivered on 29th June 1996 at Thurgarton church.